​With over 16 different known varieties of picture jasper, Royal Sahara Jasper is the queen of the fleet. The stone was discovered in 2006 by a lapidary couple during a gem rock hunt in the Eastern Sahara desert in Africa. The difficulties they encountered to include the desert environment with 140 degree temperatures, the remote location far from civilization and supplies and the logistics of getting many pounds of rocks back to the U.S. dictates that this stone is the most expensive of Jaspers for a Lapidary to obtain. Fossils found in many of the rock “noduals” suggests that the they were formed from hot mud flows approximately 35 to 40 million years ago when the North African Sahara Desert was a combination of volcanic regions, tropical forests and saltwater seas. Jasper is a stone of gentleness and relaxation. It is professed to enhance one’s ability to relax and bring tranquility, comfort, wholeness and healing. As with all Jaspers, it is a good protection stone. 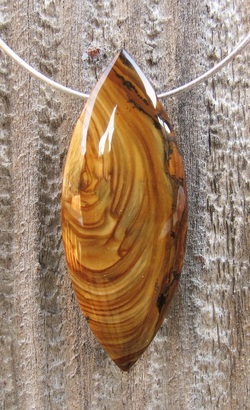 This pendant measures 2 1/2" x 1" x 3/8" with a full curved dome on two sides.